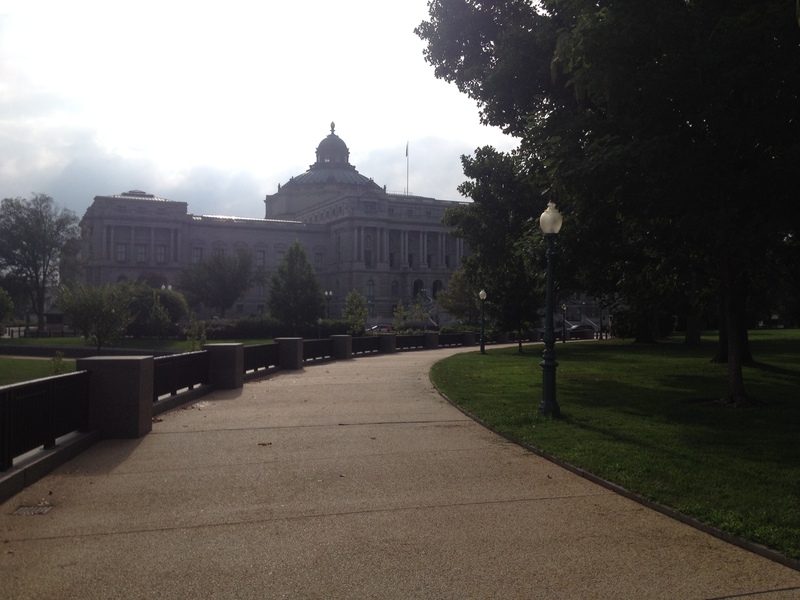 The Lessing J. Rosenwald Collection at the Library of Congress is one of the finest collections of illustrated books in the US. Calligraphy, both in the form of manuscript as well as printed writing manuals, is well represented in the collection. The Rare Book & Special Collections department has other collections that fill in gaps in the printed writing manual subject area. Acquisitions are made to expand their holdings, and I was allowed to review a number of books that have come into the collection but haven’t been cataloged yet. I was eager to find hidden books in the uncatalogued book truck. Looking at material that hasn’t been pored over is a thrill because I might find an item that hasn’t been researched yet, or has some other importance that awaits discovery. This time, I was rewarded with discovering a new-found friend, Joseph Seavy. I pulled a little blue pamphlet off of the truck, placing a flag to mark its location and knew immediately that I was the first to see this as a related item to the Newberry copy. The fact that I was looking at another copy, knowing that there may be only one other place that it existed was exciting. The Massachusetts Historical Society’s copy had been microfilmed, but the only images they took were of the cover and inside wrappers. No images of the text pages were available. I anticipated seeing the watermarked letters, and hoped there would be writing over them to show how people used these instruction books. You can see the letters in this copy are well-written. And they are of the same style as the letters in the Newberry copy. I turned the page and subsequent pages, and all were filled with a fairly accomplished hand written on both sides of the laid paper. In both books, the letterforms are the same, the scribal version shows the influence of the pressure of the pointed pen. I’ve asked for a light sheet (a paper thin light source) and lay it behind the one of the manuscript pages but cannot detect a watermark. And the book is laid paper, not wove as is the Newberry copy. So, there’s at least one copy of the book without watermark and LC’s copy doesn’t have a volume number either. Now I want to know more because this mystery is intriguing. 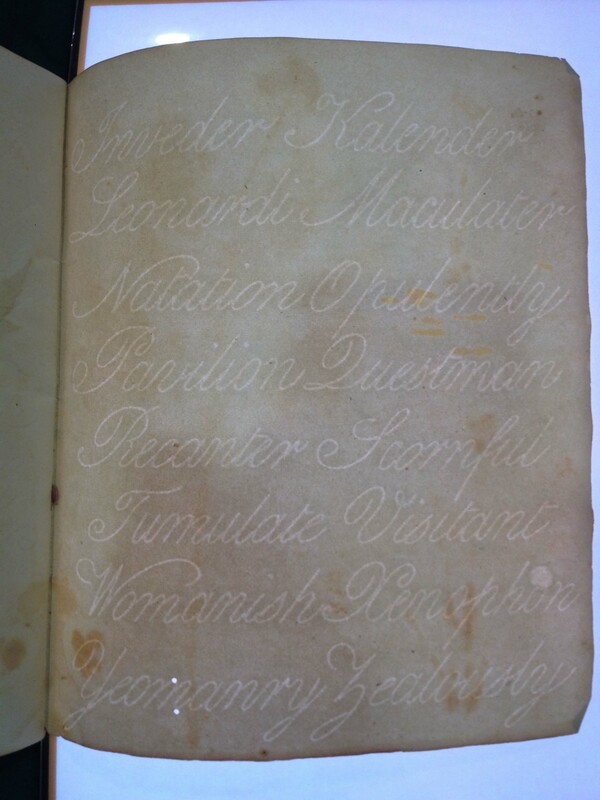 I know of no other copybook where the instruction is produced by watermark. The title and instructions are printed in Boston, 1814 and the price is somewhat inexpensive with a current value around $2.25. That would not be outrageous for a parent to buy a copy of an instruction manual for a child. If all four volumes were purchased it would be around $9.00 today. How many copies of this series survive? I go back to Worldcat and fight the digital/book blindspot and try to narrow down where an actual book is rather than the mircorform or its digital equivalent. 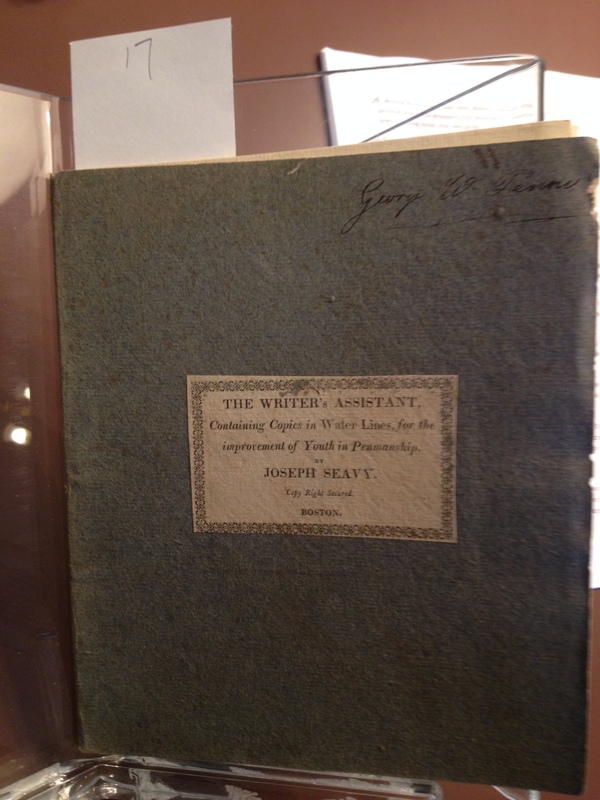 The American Antiquarian Society in Worcester, MA has Vol. 2 & 4. And I’ll be headed there in a few weeks, so I’ve gotten lucky because I’ll be seeing 2 more examples from this series. 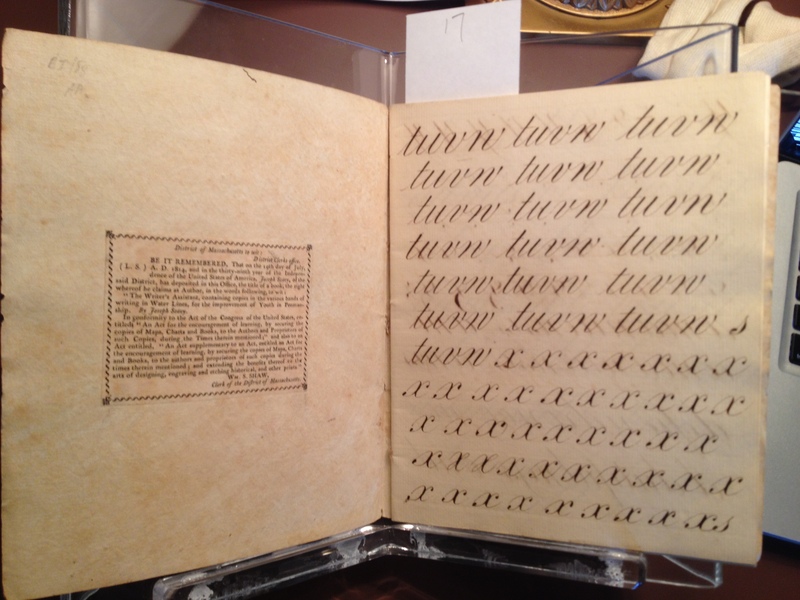 I am convinced that there is no watermark letterform present in this pamphlet owned by George W. Fenns. 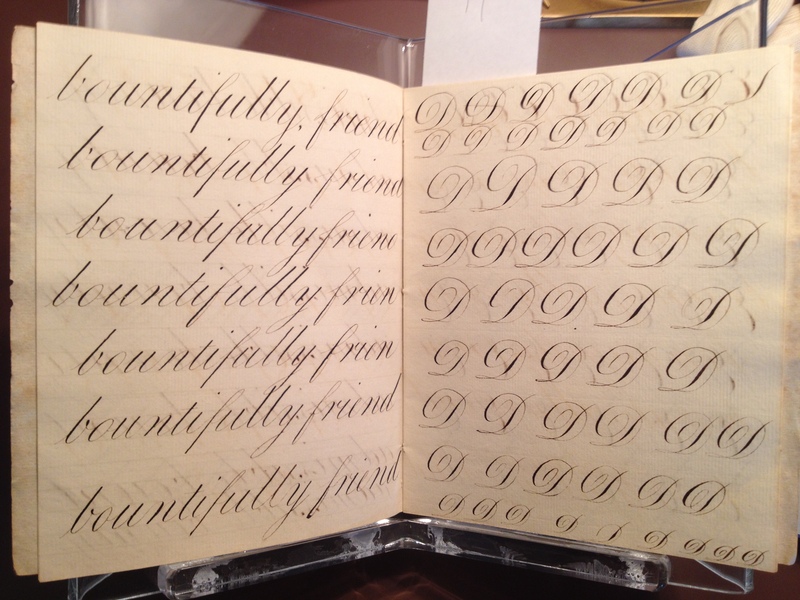 He may have been the scribe that filled this book front to back with competent practice lettering. A quick search fails to find him. The hunt is on. I want to know more about this book. And I want to know where/how one unnumbered volume has laid paper instead of the watermarked paper. I’ve got more questions than answers – and that is exhilarating.